The waters have devastated parts of the state leaving some missing and others wondering how they'll regroup. NBC's Miguel Almaguer reports. Officials said 172 people were unaccounted for late Friday, but stressed that those numbers could rise or fall since communications were so poor. No one was officially listed as "missing." Weather.com reported flooding was affecting parts of a 4,500-square-mile area, almost the size of Connecticut. "The problem now is relatively little additional rainfall may trigger additional flash flooding," weather.com senior meteorologist Jonathan Erdman said. "With more areas of rain and scattered thunderstorms expected this weekend, a quick inch or so of rain in less than one hour may cause additional rises on already swollen creeks and rivers." As crews worked around the clock to rescue the stranded – including 85 fifth-graders who were on a school trip – amazing stories of survival and escape emerged. Watch as one Colorado flooding victim returns to her home for the first time. NBC's Joe Fryer reports. “I had three boat rides, one surfboard, a motorboat and a canoe,” Nancy Coleman said of her flight from water-logged Longmont. A visually impaired man walking in Denver with his service dog was swept into a drainage ditch and pulled out four blocks later by a police officer and paramedic. Emergency workers used a zipline to bring a woman to safety at Big Thompson Canyon. A father of four who spent two hours in a submerged car held a press conference to thank his saviors. "Two hours was an eternity,” said Roy Ortiz, who got trapped when a bridge collapsed early Thursday, sending his car into Rock Creek, flipped on its roof. He said while he waited for help, with his head position in a small air pocket, he prayed and thought about his family. “Everywhere I moved, there was the water," Ortiz said, according to the Broomfield Enterprise. Ortiz was one of the lucky ones. A young woman whose car got stuck in floodwaters was found dead Friday morning in Boulder. A man who was with her and got out of the car to help was also killed. A man was found in a creek in Colorado Springs and a fourth person was killed in a building collapse in Jamestown. Because the waters obliterated many roads, authorities still don’t have a handle on how many people might be stranded or missing. “The thing that worries us the most are the things that we don’t know right now,” Boulder County Sheriff Joe Pelle said in an afternoon briefing. “We don’t know about lives lost, homes lost, people stranded in many, many of the canyon areas in our upper communities. Boulder County Sheriff Joe Pelle gives an update on the damage wrought by Colorado's floods and how it is hampering efforts to assess the destruction. “We have our hands full simply trying to assess what we have on our hands,” he said. Late Friday night, the Boulder County Office of Emergency Management reported a breach about 300 feet long in the pipeline that carries about 90 percent of Boulder's untreated wastewater to a treatment plant, with the wastewater being disharged directly into Boulder Creek. There was no risk to drinking water supplies since all drinking water from the creek is drawn upstream from the breach, the agency said. The city was working on a temporary bypass around the breach. Four National Guard helicopters were enlisted to drop supplies and begin taking people out of two towns surrounded by raging rapids: Lyons, with more than 2,000 residents, and Jamestown, with about 300 people. Late Friday, an OEM spokeswoman said the Guard had evacuated about 190 people from Lyons and about 130 from Jamestown. Aerials from NBC affiliate KUSA show the aftermath of devastating flooding that killed at least three people in Colorado. Above Jamestown, 85 schoolchildren and their 14 chaperones were waiting for a ride out. “The children are safe and sound. They’re in a good, dry situation. They’re well-fed,” Pelle said. Waters were receding, but there was still rain in the forecast and the threat of more flash floods. Authorities worried that stir-crazy residents might venture out into dry areas and get trapped by a surprise storm. Pelle could not predict how long it would take to reach everyone who could not get out. 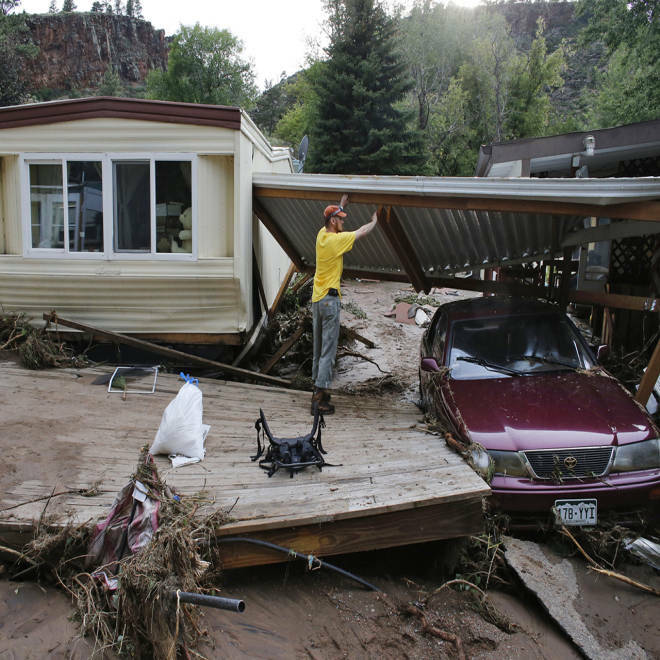 Local resident Ben Rodman helps a friend salvage her home Friday after floods in Lyons, Colo.